Dont let automobile troubles catch you unprepared. Let our techicians Preserve the life and value of your vehicle. We can keep your vehicle in prime condition for the road ahead. Drive with Full Confidence and Peace of Mind. Many drivers find themselves at a loss because it can be difficult to find a qualified shop to conduct their auto repair. Tempe residents especially are prone to this kind of feeling, where the car you drive can be a statement of personal taste, rather than a matter of necessity. 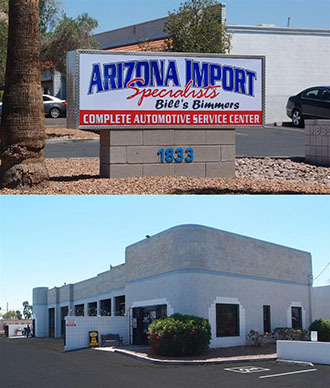 Since we opened our doors in 1980, Arizona Import Specialists has proudly served Tempe residents with all of their import service requirements. As a leading import auto repair shop, we have constantly expanded our range of services and the vehicles which we service. We take immense pride in our ability to work with the finest of import vehicles and restore them to their former glory. In addition to dealing with all major repair jobs for your import vehicle, we also conduct all the necessary auto maintenance procedures to ensure that your vehicle retains peak performance and preserves its value. At Arizona Import Specialists, we have taken steps to make our import auto services available to all drivers of fine import vehicles in Phoenix Arizona. Whether you drive an Audi or a Toyota, we have the equipment and mechanical prowess to get you back on the road in record time. Our technicians are certified by the National Institute for Automotive Service Excellence and qualified to work on the finest automobiles in the world. Our approach to car care is one of attention to your personal needs. We understand that everyone has a specific set of needs when it comes to their vehicle, and we work hard to ensure that the needs of our customers are met. We feel that our business model has been successful over the years due to our foundation on the business ethics of customer service and the building up relationships with our customers. Since we opened our doors, we have rigorously preserved and built upon the fundamental building blocks of trust and customer satisfaction. We have noticed that many customers have come to us for the first time with a frustrated and distrustful outlook regarding auto repair facilities, it has been our pleasure to prove that there are still good guys in the business. By working with you to understand your expectations, we develop a personalized repair regimen that reflects your vehicles requirements, while making sure that you’re automobile remains reliable. Let us earn your business and your trust, as an independent automotive repair shop; we are able to dictate our own business practices. This means that we can do whatever is necessary when it comes to making sure that our customers leave happy. For us, it’s not just about fixing cars, it’s about helping people get the most enjoyment out of their vehicles for as long as possible. By removing the questions and apprehension about whether your vehicle will serve you well, we can help make driving a pleasurable experience once again. The staff is standing by to address your concerns. Whether you wish to have a few questions answered about what we can do for you, or you need to schedule an appointment for a checkup or general maintenance. We wish to extend our hand and begin building a meaningful relationship with you as a customer. If you aren’t sure that we are the right shop for you, feel free to come down, inspect the grounds and speak to the owner; just ask for Joel Bartko, and I’ll be right with you. Call now for information on how proper alignment can benefit you and your vehicle.